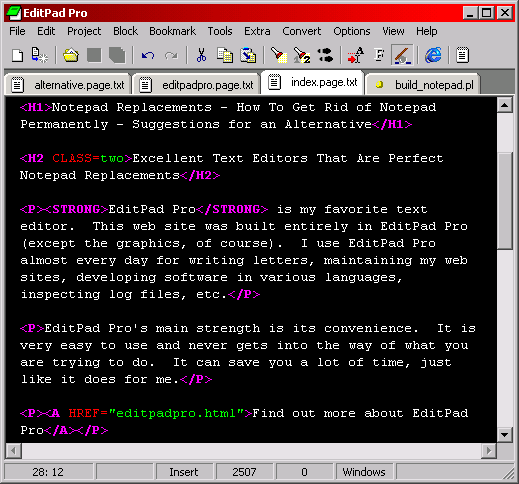 EditPad Pro is my favorite text editor. This web site was built entirely in EditPad Pro (except the graphics, of course). I use EditPad Pro almost every day for writing letters, maintaining my web sites, developing software in various languages, inspecting log files, etc. EditPad Pro's main strength is its convenience. It is very easy to use and never gets into the way of what you are trying to do. It can save you a lot of time, just like it does for me. Notice how I configured EditPad Pro to use white on black text, which I find easier on my eyes, and used some of my favorite colors for the various syntax coloring elements. Almost everything in EditPad Pro can be adjusted to your tastes and habits, making EditPad Pro a most convenient text editor. EditPad Lite is also an excellent Notepad replacement. EditPad Lite lacks many of the powerful features that make EditPad Pro such a joy to use. However, it is still a solid text editor with all the basic functionality you would expect. While I find EditPad Pro to be a bargain at $39.95, EditPad Lite is free for non-commercial use. Copyright © 2002 Jan Goyvaerts. All rights reserved.